It’s clear that the mortgage industry has changed. As more people from the technological age become real estate professionals or home buyers, more and more research is done about you and your competition online. A key to growing your business with the new consumer is to get found online. Building your online brand can sound overwhelming or time-consuming, but it doesn’t have to be. Being present and active on these 4 websites can help grow your influence online, and connect you with real estate professionals and potential clients in your market. 58% of the adults in this country are on Facebook. That’s enough of a reason to be present on this network. But simply having a profile isn’t going to help your business. You probably don’t want to mix professional conversations and connections in with your family pictures and cat videos. This is where the Facebook business page comes in. These pages function a little differently than a profile. Rather than “friending” someone and then needing them to accept your request, anyone can “like” your business Page and see your news and posts on their feed. To set up a business page from a desktop, simply log in to your personal Facebook account, then hit the downward facing triangle at the top right of your screen. Then select “Create page.” You can then select what type of business you have, your contact information, location, and more. Be sure and fill out your business page completely, or you could be missing an opportunity to receive a phone call or a visit to your website. Set up your page when you have some time to write up a short and long description of your company, upload a professional headshot, and add a cover photo that includes your branding. Industry updates from reputable sources: Borrowers care about rates and the housing industry, because they want to make sure they’re making a smart investment when they buy a house. Share articles from national news sites and local reports on the housing industry to keep them informed. Content from your website: Though you don’t want to pack your timeline with your own content, (it’s called social media for a reason) sharing your own blog posts or website pages when they’re helpful is definitely a good thing. There’s a difference between posting about yourself without including useful information, and sharing your own helpful content. Shared posts from local partners: If you get a lot of business from a particular real estate office or agent, then the share button should be your page’s best friend. By promoting their content, you’re increasing their reach, and hopefully increasing their business as well. And when they’re doing well, you will be too. If an agent shares a helpful blog post, eBook, or other content that would be helpful to potential borrowers, pass it along to them. Once you start posting, share your page with your Facebook friends and past clients so you can start increasing your likes. Google+ is one of the most underrated social networks, mainly for it’s ability to impact your search rankings. If someone is connected with you on Google+, your relevant articles are likely to show up in their Google search results when they’re searching for information. If you’re going to use Google+, it’s smart to publish some content directly to your page, where it may rank higher than other social channels or your blog. When you have a Google+ business page, you can also set up your company on Google My Business in just a few minutes, which means your business information will show up in the side bar of a Google search. When logged into your Google+ account, head to www.google.com/business and select “Get on Google”. You can then type in your business name, claim your business, and integrate your Maps and search information with your Google+ page. This will allow your contact and business information to be easily seen in search results. If you’re going to be social on one review site, make it Yelp. This site covers all kinds of shops, restaurants, and services and is a hugely popular app as well. If a real estate professional comes across you online or in person and they want to see how your business really runs, they’ll head over to Yelp and see what your customers are saying. Here are a few things you can do to ensure you’re getting reviews on your Yelp page, that you can share on social media and interact with. First, check and see if there’s a page set up for your business: Search for your name or company on Yelp, and see if your business appears. If not, you can set up an account so others can leave reviews there. Head to www.biz.yelp.com and type in your business name and area, and hit “Get Started”. Then, make sure your company information is correct: Yelp tells visitors your location, hours, and contact information. If you set up a new page or you already have a page, you’ll want to make sure this information is up to date and correct. Any time you move offices or change hours, be sure to update this information. Direct people to your page: Once your page is up and updated, you need to let people know it exists. The easiest way to do this is to add a Yelp button to your website or blog, linking to your Yelp profile. When you create a Yelp for Business account, you have access to different buttons you can code on the bottom of your site, next to your social media links, or at the bottom of your blog posts. It’s important to respond to every review you receive on Yelp. Yes, that means the negative ones as well. Thank the people that leave you positive reviews, and be empathetic and understanding when replying to any negative ones. The only thing that looks worse than bad reviews is a defensive business owner. It’s your online resume: If you decide to change offices in the future, anyone can look at your LinkedIn page to see your qualifications and job history. Keep your page updated with any volunteer work, awards, and certifications. It’s easy to connect: Sending a local real estate agent or past client a Facebook friend request can seem a little too personal. However, LinkedIn is a more suitable choice for making these online connections and staying in touch. Since it’s viewed as a professional network instead of a place for family and friends, you can feel comfortable sending connections to more people. 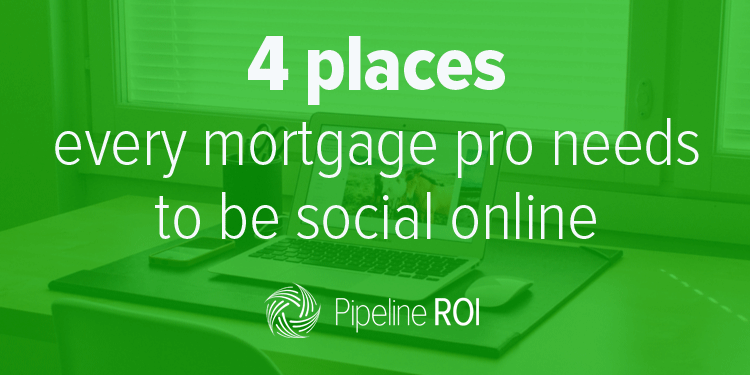 You can discover other professionals: LinkedIn groups are a great opportunity to share your thoughts on industry issues and connect with other mortgage lending and real estate professionals. Don’t be afraid to chime in on discussions and ask questions. LinkedIn is often thought of as a “set it and forget it” social network, but you should be sharing posts and engaging with your connections at least a few times a week. You can even publish articles directly to LinkedIn, which can help grow your exposure on the network. Staying active on these four sites will allow you to grow your online presence, which means more local real estate agents and borrowers will be familiar with your business. This article originally appeared in the July 2015 edition of National Mortgage Professional Magazine.